Last weekend I had the pleasure of attending a small tournament at Mishap Games, a store I have been wanting to visit since it opened several years ago. We would be using 1,500 point armies and some Games Workshop based missions for the three rounds. I opted to bring my Blood Angels without Knight support. 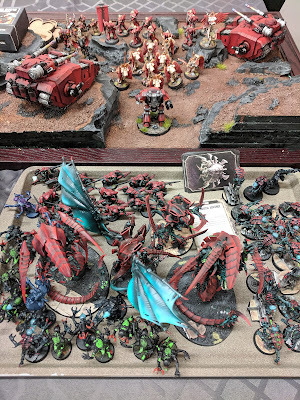 I also brought some Tyranids for the TO to use as a ringer army since there was going to be 7 players otherwise. Round 1 I was matched up against Josh and his Death Guard. The mission was Patrol, which required that players only deploy three units to begin the game, one of which must be a Troop choice. Remaining units arrive from the player's board edge on a 3+ on turns 2 and 3, and automatically arrive turn 4. The victory conditions were just kill points. I had deploy first and opted for a unit of Intercessors, the Primaris Ancient with Relic banner, and the Sanguinary Guard. Josh countered with a unit of 11 Plague Marines, a unit of Blight Haulers, and a Daemon Prince. Josh had first turn and moved up, using Cloud of Flies to block shots to his Plague Marines. I largely stood there and took some potshots with my Intercessors, dealing a couple wounds to the Blight Haulers. Josh had a good portion of his army arrive in his second turn and continued the push upfield. 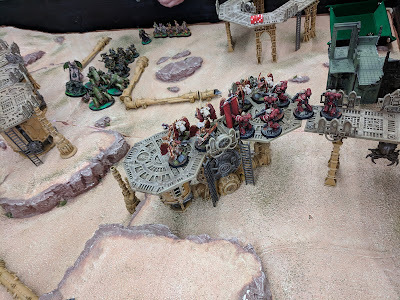 I got most of my forces in the bottom of the turn as well and jumped forward with the remaining Sanguinary Guard, charging the Blight Haulers and destroying one of them. The game devolved to a scrum in the middle, with neither of us killing a unit until turn 4. In that turn, I killed off the Blight Haulers and one Blight Drone, but wiffed against severely wounded Plague Surgeon, Warlord Daemon Prince, and second Blight Drone. In return I lost the Contemptor, my Warlord, the last Sanguinary Guard, Sanguinary Ancient, and the Chaplain (died in Overwatch), resulting in a 6-2 loss to Josh. After lunch, for round 2 I was paired with Zach and his Deathwatch. His list had a unit of Hellblasters, complimented by some Vets and Intercessors and a Leviathan Dread. The mission was Big Guns Never Tire, which had four objectives scored end game, with bonus points for destroying Heavy Support units, which also had boosted ObSec. Zach had first turn and killed off one of my units of Intercessors, but I was able to tank most of his fire, with a lot of it out of range. In return, I was able to shoot down his Corvus Blackstar and plink away at his Hellblasters and Intercessors. In turn 2, the Leviathan dropped in and wiffed on my Sicarans. 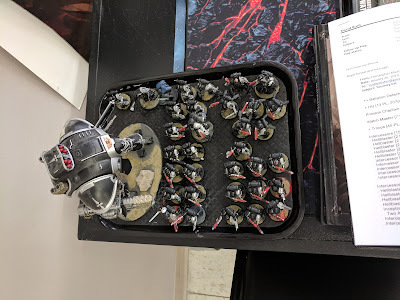 In my turn, I dropped in my Sanguinary Guard, which promptly got nuked by an Auspex scan that killed 5 Sang Guard on 6 shots from the Hellblasters. The Sanguinary Guard still managed to make it to combat and wipe out the Intercessors, while my Captain engaged the Leviathan and plinked some wounds. The game continued for 6 turns, with the last two being mostly Zach's Watch Master against my two Sicarans, ending with one model on the table for Zach and just four for me, but three of them on Objectives, resulting in a 9-2 victory for me. In the last round of the day, I matched up against Chris and more Deathwatch. 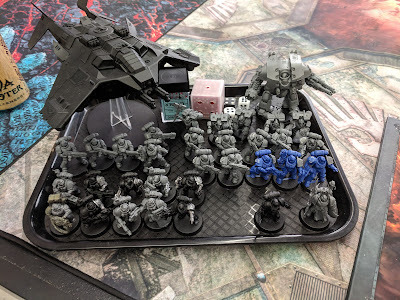 Chris's list featured a Knight Errant to support his Intercessors (mixed with 4-5 Hellblasters) and Vets. Chris had first turn and moved up with his Vets and Knight. I was deployed defensively and he only managed a couple wounds on my Contemptor and an Intercessor. By contrast, my turn 1 was devastating. Shooting wiped out the Vet unit and 3-4 models out of each Intercessor unit. Then the Sanguinary Guard charged the Knight and, in the course of fighting twice, took it down to a single wound. The rest of the game was largely a foregone conclusion, with my shooting plinking away the remainder of the Intercessor units and taking over the board with minimal casualties. The final score was 15-0 for me and my Blood Angels. At the end of the day, I think I'm finally getting to be more comfortable with the Sicarans, and getting better at using them effectively. 1,500 points was a bit of a mind-bender for me, but overall I was pretty happy with what I ended up with. Obviously one of the Ancients was a bit unnecessary - but was there mostly to unlock the ability to take a third Relic unit, giving the Contemptor more durability in the form of a 2+ save and a 6+ ignoring wounds. My 2-1 record was enough to take home second place by a single point. I had a lot of fun and I am looking forward to hearing about more events getting put on by the great group of guys playing at Mishap. Thanks go to Dave for putting it together, and to each of my opponents who were a pleasure to play against.